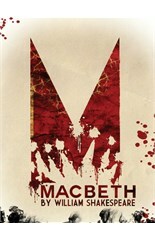 Murder, madness and magic haunt every shadowy corner in the most powerful of William Shakespeare’s great tragedies. After receiving an ominous prophecy on a blood-soaked battlefield, the Thane of Cawdor and his ambitious wife claw their way to the Scottish throne, and damned be all who stand in their way! Each step closer to fulfilling his royal Fate leads the General deeper and deeper into a fiendish quagmire of carnage and corruption, from which none can survive; not even him. Join The Rep as it casts a spell on Arkansas audiences with this powerful production that will keep you on the edge of your seat. The cast is lead by Michael Stewart Allen and Jacqueline Correa as the scheming couple. Others in the cast are Ryan Allen, Oliver Archibald, Adam Cook, Courtney Bennett, Christina Clower, Berkeley Courtney-Moore, Brooklyn Courtney-Moore, Heather Dupree, Cary Hite, Robert Ierardi, Damon McKinnis, Joseph J. Menino, Gregory Myhre, Seth D. Rabinowitz, Jacques Roy, Marisol Sela, Kurt Benjamin Smith, Mitch Tebo, David Tennal and Damian Thompson. The production is directed by Rep Producing Artistic Director Bob Hupp. Other members of the creative team are Mike Nichols (scenery), Marianne Custer (costumes), Dan Kimble (lighting), Allan Branson (sound), Lynda J. Kwallek (props), Rob Pickens (wigs), Geoffrey Kent (fight director), Mark Binns (composer), Paige Martin Reynolds (dramaturg/assistant director) and Katie M. Dayley (AEA stage manager). The production opens tonight and runs through September 27.